WAIT WAIT. 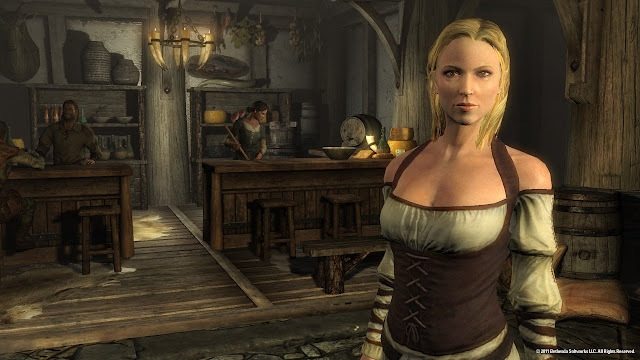 Firstly I need to clarify that the Skyrim posts you've read thus far have been by Luke, who has been largely focusing on marrying a wench, killing elves and filling a house with cheese. I am not he. I have been playing this game, in earnest, for more than eighty hours now, and whilst I've only just managed to finish that central quest (YEEAAH) I still have what probably amounts to an additional 100+ hours of sidequests, quest chains, draconic Words of Power to find, cities to become the Thane of, battles to fight in, dragons to kick back into the well of eternity. Life is good. So I thought I'd drop by to share my thoughts thus far on the game which ultimately I don't think anyone has a bad word to say about (I will try). 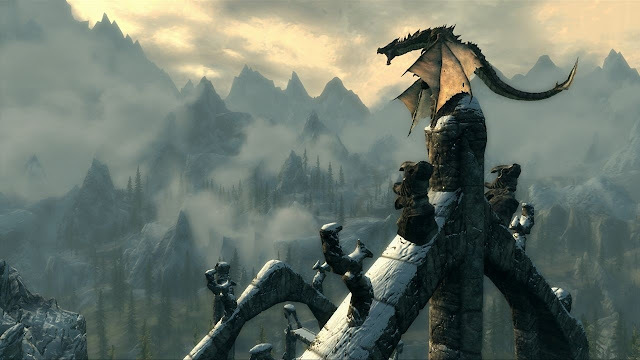 Skyrim has redefined Epic, and the gaming world is almightily happy. Firstly this is only my second console game - I was a purely PC gamer beforehand (with a limited scope, it had to be said). My introductory PS3 game was Dragon Age 2, which I've talked about ad nauseum on both this blog and my own. I mention it because it became my point of comparison. And not always in a purely positive sense either, even though I think most people would happily consider Skyrim a far superior game. So lets try and clarify what DOESN'T work in Skyrim, because I think everyone's covered what does. a.) A severe lack of variation in gear. I have been wearing the same armour and bearing the same gigantic axe for the last fifteen levels. FIFTEEN. And even when you do find a marginally better piece, it looks identical to the piece you just changed. It makes the customisation of your dude a bit - unexciting. b.) Ugly interiors. The beauty of Skyrim's exteriors is totally undisputed, but once you go inside? Drab, boring, monotone and identical to any other building of that type anywhere else in the country. c.) Lack of variation in voice acting. I love voice acting in games, I really do. I develop huge and embarrassing crushes on people based purely on their voice. Skyrim has about three female and maybe five male voice actors, who do the same voice for bloody everyone. There's the brawny Schwarzenegger voice, the burly thug voice, the slimy shady voice, and the stalwart soldier voice. Thats it. Oh, also Gideon Emery (Fenris, Dragon Age 2, rating rather high on my epic voice-crushes list) voices about two thirds of the Imperial Legion. With the same voice. Sigh. And considering the sheer, bone crushing number of people you interact with - it gets old. And feels a bit lazy. d.) Lack of characterisation - this is a tough one because there's plenty of places where some solid characterisation would have shone. But everyone kind of talks like they have better things to be doing, no one particularly incites your hate or love or sympathy, no one jumps out as being anything other than one of a few options - soldierly, sneaky theify, shady, monky, magicky, foppish, farmerly. 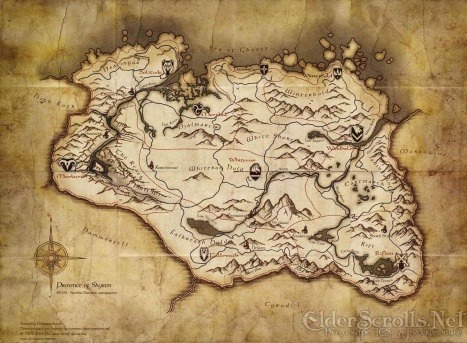 I do think Dragon Age 2 kicks Skyrims arse on this front. They characterised until they bled, for gods sake, and the result was an admittedly far smaller stable of characters you actually cared about. e.) Do need to mention the (now fixed) PS3 bug that meant any saved game that got up into the 5mg or higher bracket would start to stutter horribly while the frame rate went berserk. I spent a gooood deal of time with that horrible bug, which lost my fights, killed my horse, and made me accidentally kill my husband. Goddammit, Bethesda. Can happily report that this has since been fixed. f.) Saving. Oh lord. The saving is long, clunky, involves insane amounts of loading time and as we discovered way back in the early days - it is very. Very. Very easy to save over someone's game. They're just all jumbled in there together. What on earth would happen with three or more people using the same game? Pandemonium. It's very simple, Bethesda - drop down menu. Choose the character. Display shows all saves from that character. Player can safely save whilst knowing they aren't about to accidentally put their relationship in jeopardy by deleting a loved ones game. Urrgh. All that aside - what is good, beyond the obvious? It's an intuitive game. And that was a surprise for me - I tried to play Oblivion way back when that came out and gave up because I had no idea what was happening, how to do anything, all that important stuff. Skyrim is very kind to a baby-gamer, whilst still throwing in enough challenges to hobble anyone cocky enough to think they know enough to just barrel in there. Nope. The dragons. Oh god, the dragons. And they're unique - I didn't realise until later in the game, but they've been individually tweaked and designed so you aren't meeting the same one twice, and the experience of having your first one drop out of the sky to fight you - amazing. Also terrifying. The dragons have been done well. The whole marriage concept is intriguing, though they hid it rather well and I don't know if you'd have ever discovered it as an option without the internet. It's rather adorable to have some armored dude/lady sitting in your house and cooking you things. I married this dude. His husbandy-talk is rather adorable. It can't be said enough. You can lose hours, weeks, months in this game and not get bored. There's a million objectives, different things to do, corners to explore. The map is huge, the options are endless. I will not need any other form of entertainment for a long - long - time. Also Luke's house still has a dead elf and a growing collection of cheese. One of us is doing it wrong. I have to agree with you on a lot of these aspect. I hate when I am fighting a dragon and sometimes a villager got in the way. Guess what? I have a dragon and a whole village trying to kill me!! And on the note of gear and weapons, if you do the side quests, you tend to gt really awesome stuff. I was doing both the main quest and side quests at the same time, and I got really amazing weapons and clothing. this game rocks its so cool its like AWSOME!!!! 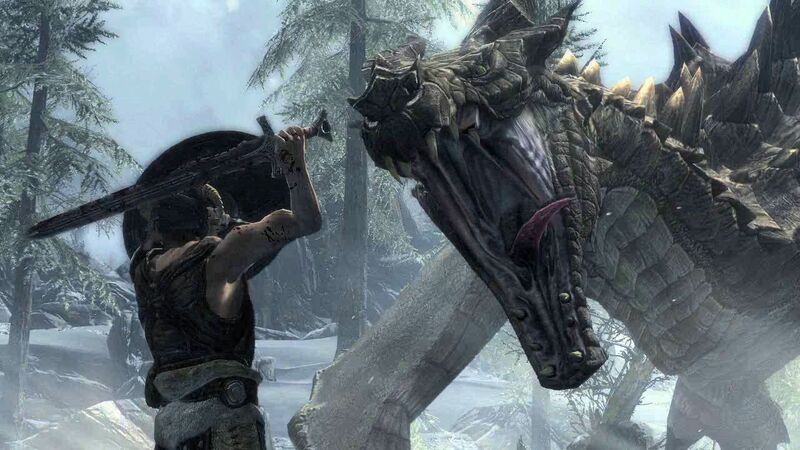 man the dragons look like so real and the graficks the bears are to week tho but this its cool anyway so play SKYRIM!